Daeyrs, a formerly homeless boy and his mother were given Michigan state housing around Christmas and the little boy was close to getting all his wishes come true. All he wanted all his life was a room and a bed of his own. Thanks to a social worker who was handling their case, Daeyrs and his mom Dionna were given fully a furnished home furnished by Humble Design. The groupl caught the little boy's precious reaction on video and it will surely bring you to tears. 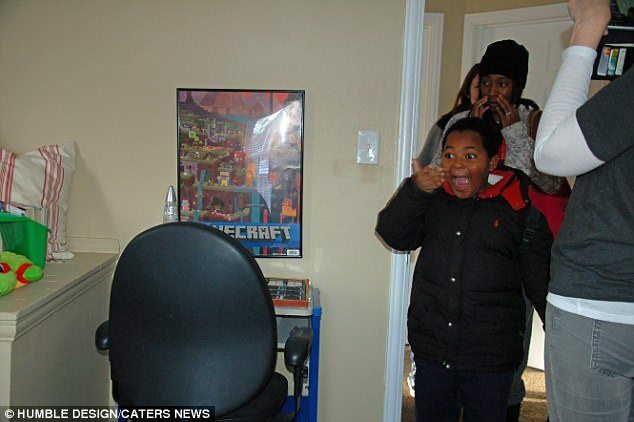 The video was shot on Dec 20th and captured the former homeless boy's reaction after he sees his own room and bed for the very first time. Immedietley after being excited, he has tears in his eyes and starts weeping with joy. "They moved into this house but didn't have any furniture and were sleeping on the floor," said founder Humble Design. "We were referred to Daeyrs and his mother by a social worker, and our first order of business was to ask them exactly what they would like in their house to make it feel like a home." "We furnished and decorated the house from top to bottom with donated furniture and goods from our warehouse - from curtains on the window to kitchen appliances, we cover every detail." Finally, Daeyrs has a place that he calls his own and refers to himself as the man of the house but more importantly, the little boy will have his own bed to sleep on.